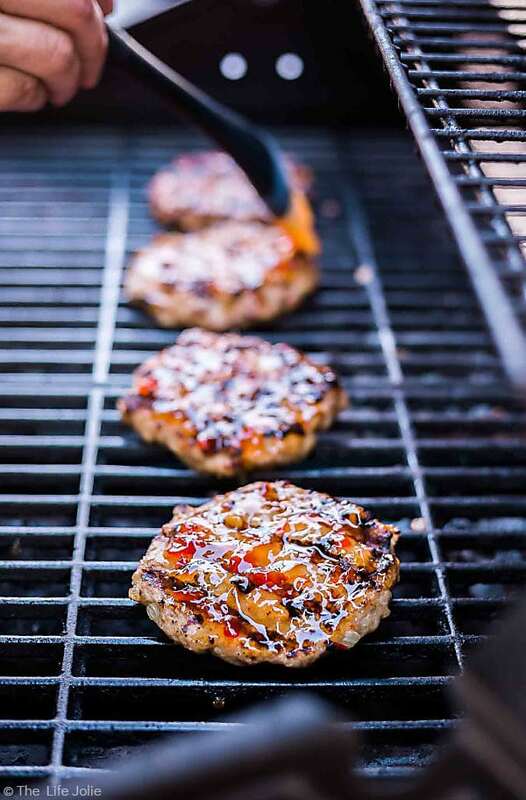 These Spicy Sweet Chili Turkey Burgers are an easy summer recipe to make on the grill. This is a simple and healthy way to spice up the usual burgers and throw a cook out or summer party your guests will love! Well, I’m back but today I want to talk to you about food! Now, there’s no denying that Jessy does the majority of the cooking in our house, and she does a great job with it. But when it comes to grilling, that is my domain! It’s only right that I come here and share a tasty grilling recipe that we created. The Fourth of July is right around the corner and the perfect holiday to fire up the grill. Did you know this is actually our anniversary (See Jess? I remembered!)? Yes, we were ‘those people’ that got married on Independence Day, but at least we had free fireworks! Now we are not super romantic, “anniversary people.” We love each other very much but we don’t make all these extravagant gestures to celebrate the day. I think Jessy will agree with me when I say that we love nothing more than spending the Fourth of July grilling and spending time with friends and family! As far as I’m concerned, nothing is more American than a good, old-fashioned cheeseburger. But since Jessy is always looking for interesting ways to kick things up a notch, we decided to deliver a turkey burger with a spicy kick! This is certainly true in our house, especially Jessy! Frank’s RedHot is the perfect combination of flavor & heat. 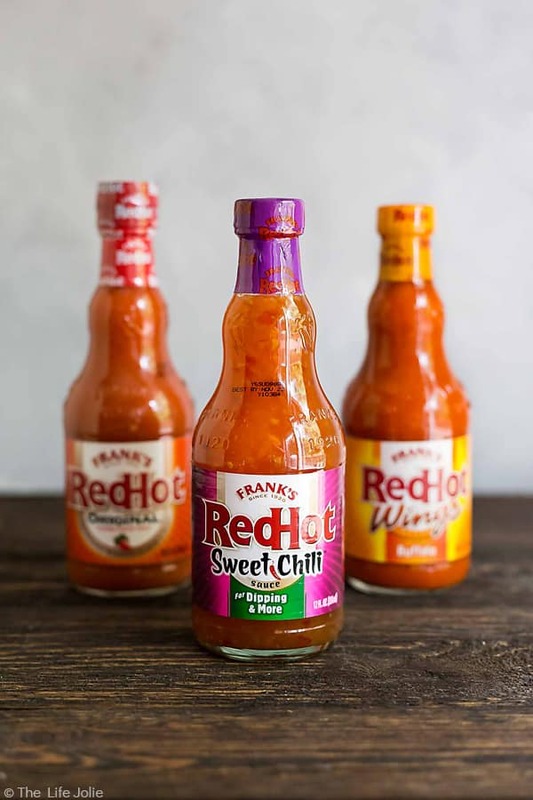 Being from an area where we know our chicken wings (we live right next to Buffalo) we know all-too-well that if it ain’t Frank’s RedHot, it ain’t buffalo! Frank’s RedHot Original is the most versatile sauce that can be used for a wide variety of dish types. Bottom line: they’re a delicious, versatile sauce, and they have tons of fun with what they do. 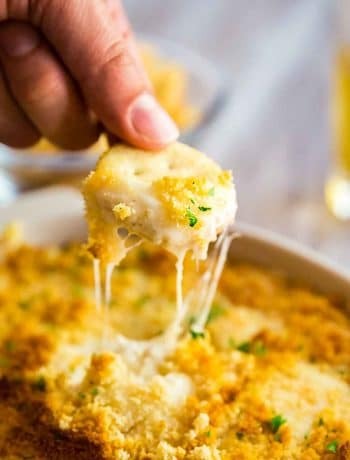 We are all about fun and this recipe is just that! It’s a great recipe for summer entertaining or summer parties. 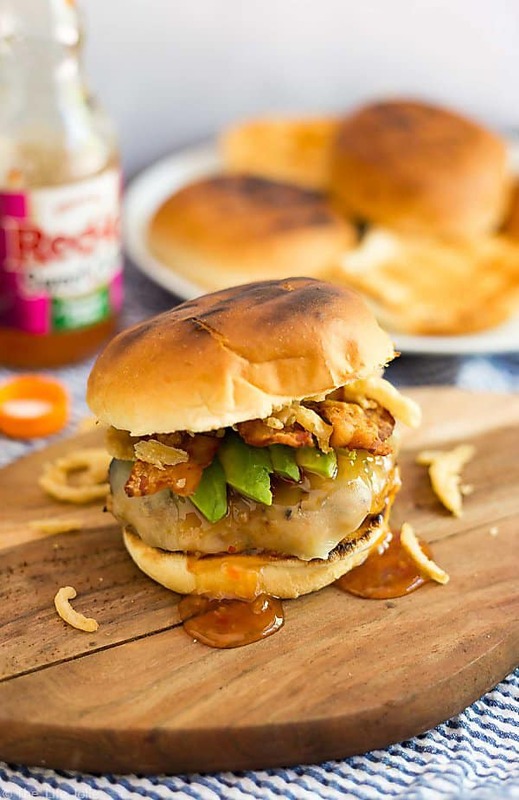 We used Frank’s RedHot Sweet Chili Sauce to add a great sweet and spicy kick to these burgers that your guests will not be able to get enough of! It’s the perfect blend of flavor and heat; it enhances food without overpowering it. 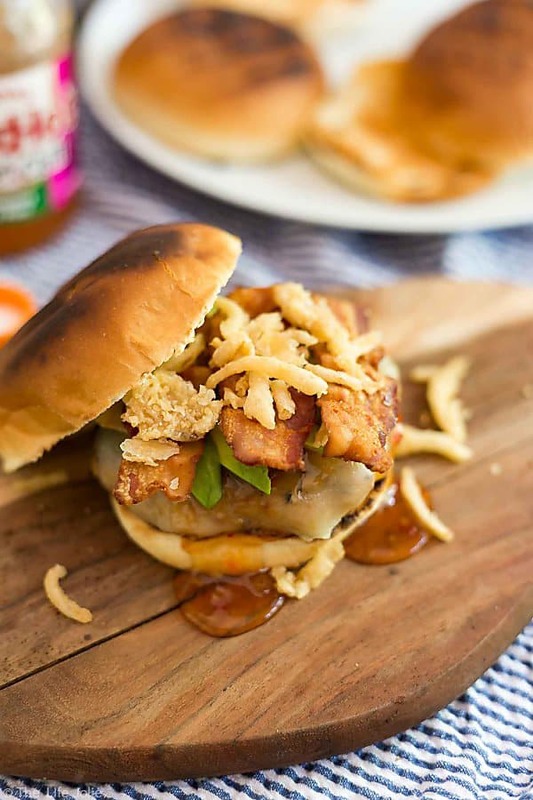 Combined with the addition of the pepper jack cheese, you have a fantastic spiciness to wake your taste buds right up! 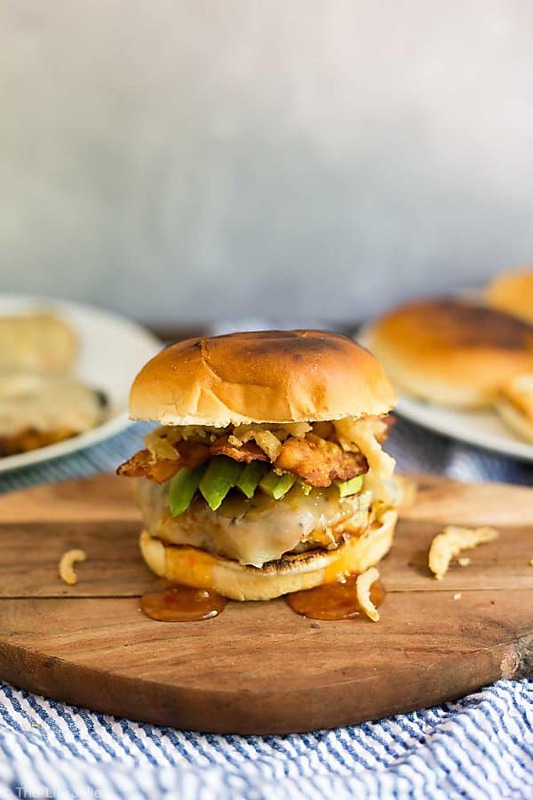 Once you add the smokiness of the bacon, creamy avocado and crispy french fried onions, you’ve got yourself a killer burger that is full of great flavor and the ideal centerpiece for your next BBQ! I hope you’ll give this a shot, it’s the perfect way to wow your guests this Fourth of July or at any summer gathering. Make it with our killer Oven Fries and our super-simple Green Bean Salad and you’re well on your way to an all-american coomk out that everyone will love! These Spicy Sweet Chili Turkey Burgers are an easy summer recipe to make on the grill. This is a simple and healthy way to spicy up the usual burgers and throw a cook out or summer party your guests will love! 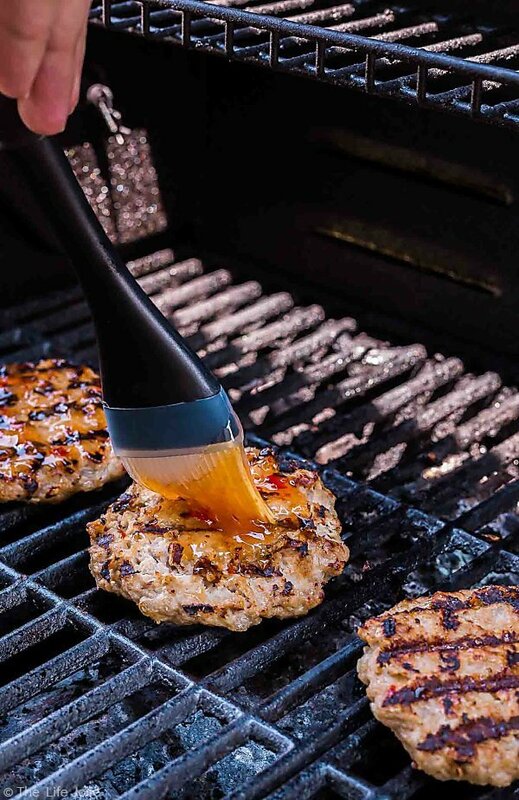 Heat the grill to around medium heat and spray it with non-stick cooking spray. In a bowl, combine the ground turkey, Frank's RedHot Sweet Chili Sauce, dried minced onions and some salt and pepper. Mix until just combined and shape into 4 equal size patties. Cook the burgers for approximately 8 minutes on each side or until the internal temperature reaches 165 degrees. Towards the end of the 8 minutes on the second side, take some of the Frank's RedHot Sweet Chili Sauce and brush it onto the burger and then top it with cheese and close the grill to melt the cheese. I also encourage you to grill the buns! 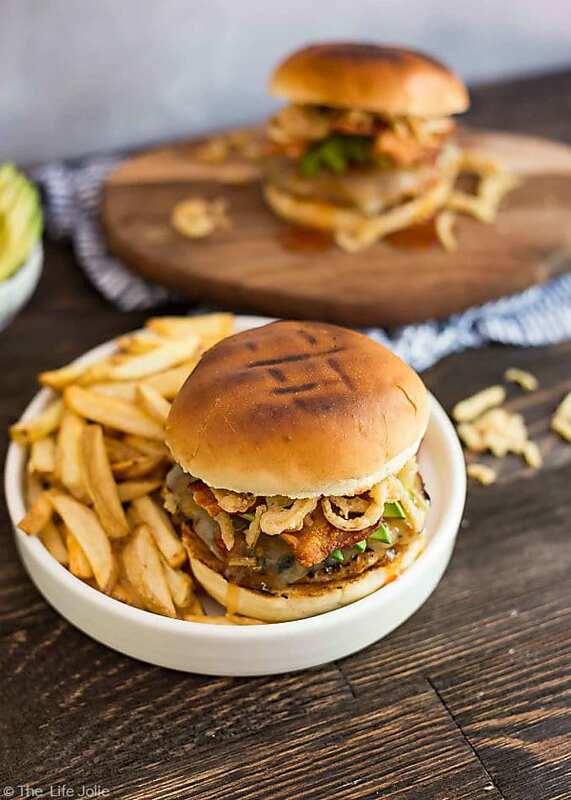 Place the burgers onto the buns, drizzle with a bit more Frank's RedHot Sweet Chili Sauce and top with bacon, avocado and french fried onions. Place the top bun on all of this and enjoy! June 21, 2017 at 7:25 pm These look SO good! I love a good cookout, and I love this spicy twist and the grilled buns! June 23, 2017 at 11:04 am Thanks Melissa! Me too- there is nothing like a good cookout!